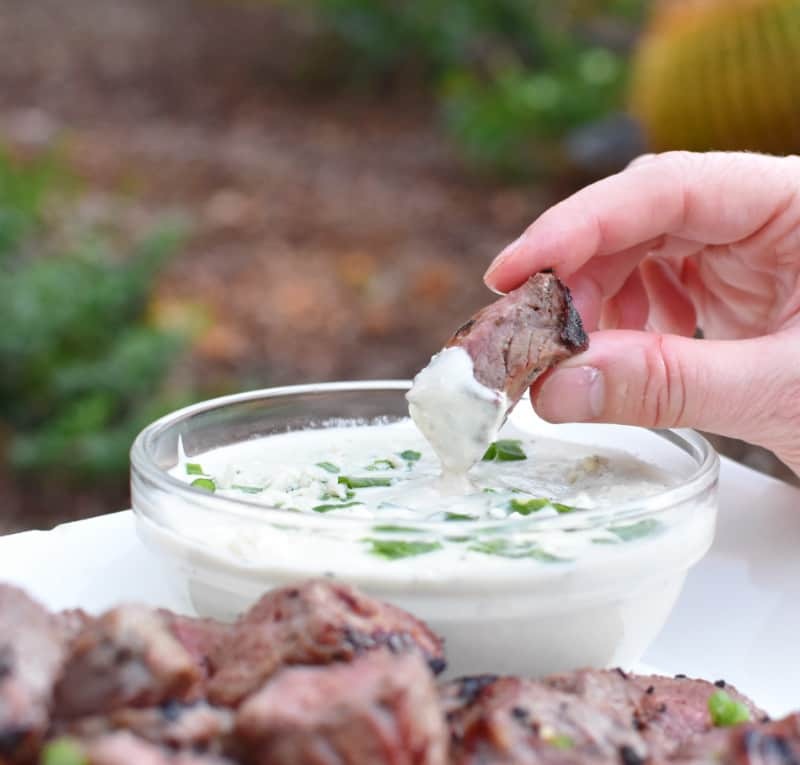 I wish I could convey the chaos that surrounded the evening we had these amazing Grilled Steak Bites with Creamy Blue Cheese dipping sauce at our campsite. You know how it is… sometimes everything goes according to plan. No hitches. No glitches. But sometimes…. well… sometimes S#%! just happens. Such was the case the night we had the Steak Bites. Then things started to go south. My sister’s RV kept blowing fuses. The day was spent testing batteries, wires, connections, bed motors, and who knows what else, to no avail. After 8 plus hours of running the generator in an attempt to figure out the issue, we gave up. My sister and spouse would end up spending the weekend without power. Bummer. Next, it was our turn for issues. 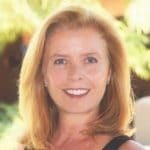 You know that smell… the barely discernable rotten egg smell that makes you stop in your tracks and sniff around like a bloodhound to determine its origin. Yep. Propane leak. That’s never good. Several hours of investigating and more propane tank switching around than I care to discuss, we were defeated (for the second time that trip!). The leak couldn’t be stopped or fixed with the equipment we had. Definitely not good at all. 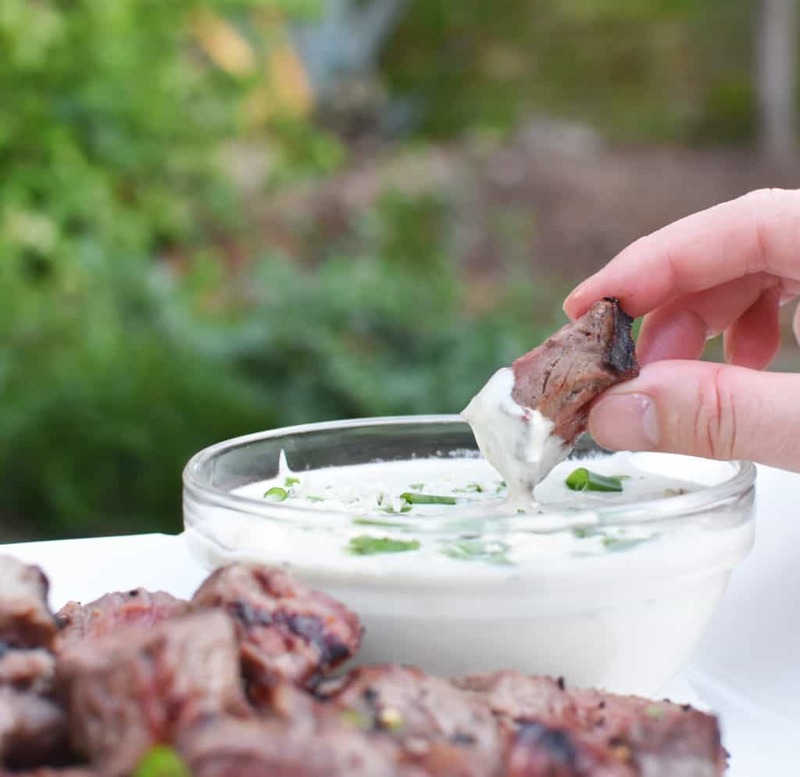 It’s especially not good when I had planned on preparing the wonderful, creamy, tangy chunky blue cheese dipping sauce on our RV cooktop. Oh wait! We have a microwave (but no plug ins at the site)… Oh wait! We have a huge generator that will run the power-hungry thing. Oops, the generator runs on propane. Can’t do that. Back to ground zero. Oh wait, my hubby reminds us we have a small portable generator that should run the microwave. Perfect! I transfer all the ingredients from the pots and pans I had planned to use on the cooktop to microwave save dishes. No problem. Turn on the microwave. No power, despite the portable generator. Guess it’s not powerful enough… That’s a drag. But… as a final, last-ditch effort to get the darn sauce out (because the sauce really does take the Steak Bites to a whole different level), I transfer all the ingredients back to the pots and pans and decide to put them on the grate over our campfire. It’s late and dark by now, but better late than never, right? On my way down to the campfire, I run into hubby. I moan and groan about the generator not being able to power the microwave. Shocked look on his face, he calmly asks whether I plugged it in…. Uh…. duh…. Nope! Figures. By now I really felt defeated! Get a good quality top sirloin steak and cut into 1-inch pieces. Put 5-8 pieces on each skewer. Liberally salt and pepper the meat (can use seasoned salt). Set grill to high temp. Sear meat skewers on all sides for 1-2 minutes per side (for medium rare). Remove from heat and let sit while you make the sauce. In a saucepan, combine cream cheese, cream, and butter. Bring to a simmer and stir until well combined. Remove from heat and add blue cheese crumbles. 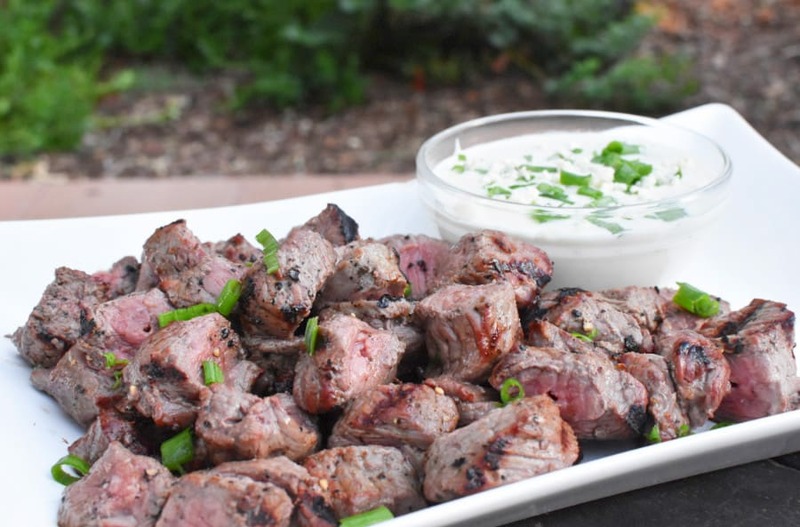 Serve drizzled over meat skewers or in a side dish for dipping. Top with sliced green onions for garnish. Full recipe below. 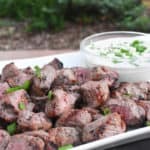 Need an easy side dish to pair with the Steak Bites? Try this awesome foil packet steamed broccoli! How about a cocktail? Here’s one! Just a reminder – the Weber Q2200 is by far my favorite camping grill! Get it here! Put 6-8 pieces of the beef on each skewer. Liberally salt and pepper all sides of the meat. Heat grill on high. 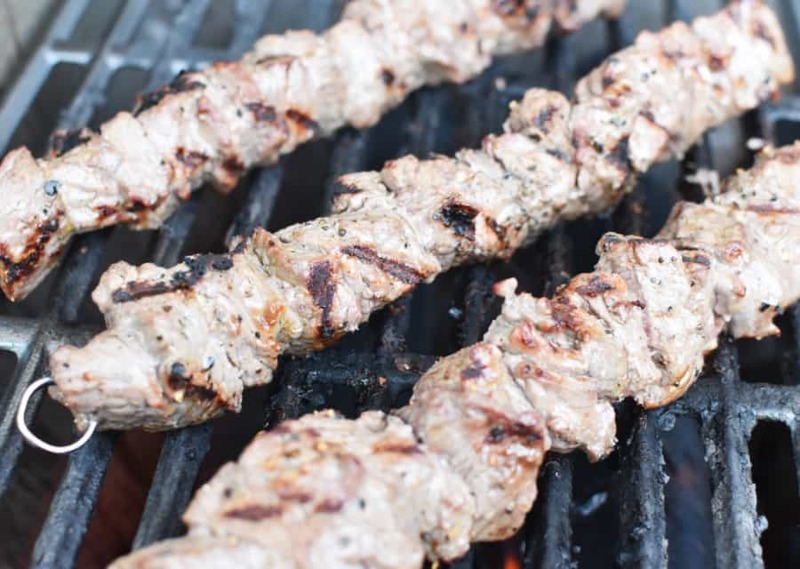 Place skewers on hot grill and sear on each side, 1-2 minutes per side. Remove from heat and cover with foil. Combine cream cheese, cream, and butter in a small saucepan. Heat over medium low heat until heated through. Stir well to combine, Remove from heat and add crumbled blue cheese. 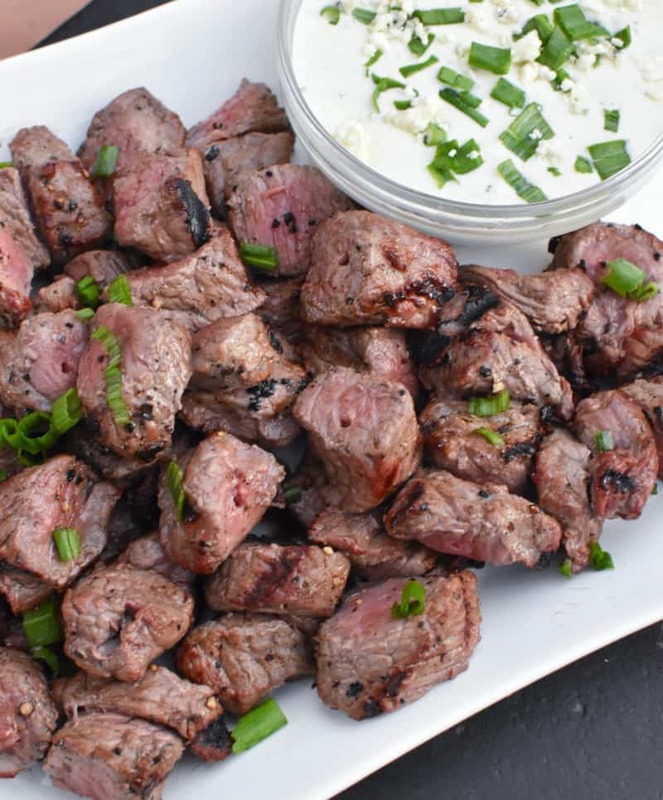 Drizzle over cooked beef skewers or in a small dish on the side for dipping. Top with sliced green onions. oooo… this sauce looks spectacular. I wonder how it would do with a dollop of horseradish? I think it would be fabulous with horseradish!! I’m definitely trying that next time. Great idea!